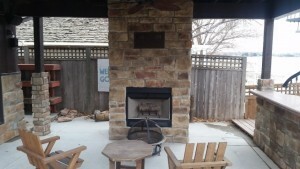 Outdoor patio fireplace and fire pits are for warmth in the cooler weather, enjoyment with get togethers of family and friends and don’t forget the food. Nothing is better than something hot on a cool night. 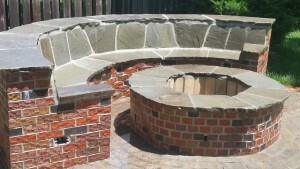 Lincoln Custom Masonry can custom build your fireplace or fire pit, or you can choose a design of your choice. This outdoor stone fireplace has two waterfalls, one on each side, and has a gas insert fireplace, so you don’t need to stack firewood. The fireplace turns on with a switch as you walk out the back door. It also has a 48″ flat sceen TV on the top half. Now that’s outdoor entertainment at it’s max. 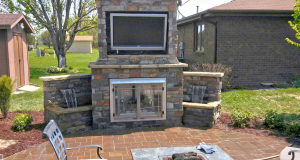 This custom built patio fireplace matches the stone on their home for a more uniform look. Who cares if it’s snowing outside, you’ll have the warmth and glow of the fireplace to gather around. 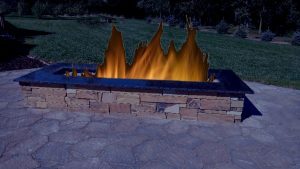 This fire pit works great for any cool evening to gather with family and friends. It even has its own seating so everyone can stay close and cozy to roast those marshmallows and hot dogs. This fire pit is a crowd pleaser so everyone can get in on the warmth and the roasting. Get your family and friends together for a night on the patio.